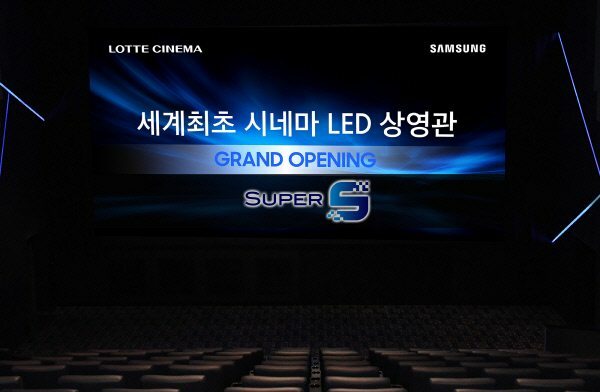 Samsung Electronics unveiled the first installation of its Cinema LED technology on 13 July in Seoul’s Lotte Cinemas World Tower 13 multiplex auditorium dubbed ‘Super S’. Samsung first demonstrated the technology at the CinemaCon convention in Las Vegas in March this year and achieved DCI compliance in May. Samsung also announced its ambition to capture 10% of the global cinema market by 2020, which it predicts will have grown from the present 160,000 screens to 200,000 in total. It would mean that 30% of its video display sales, which is mostly consumer television sets, would be B-2-B by then. The opening of the projector-less cinema was proclaimed as a historic event in the 120+ years of motion pictures. “Since the invention of the projector by Thomas Edison in 1894, the history of the film has been with the development of the projector,” News Works observed on the opening day, pointing to developments stretching from the Lumière brothers to digitisation and most recently laser-illuminated projection. Samsung’s LED Cinema is said to be able to sustain its light output for over 100,000, thus claiming to be more economical than digital/laser projectors over a five year time span. The 96 LED panels that make up the installation produce a 4K (4,096 x 2,160) image on the screen that is 10.3meters (33.8ft) wide in size. “True-to-life audio” is delivered through a collaboration between Samsung Audio Lab and Harman Professional Solutions, which was acquired by Samsung last year. The difference between sharpness and brightness was felt at once. In ‘Miss Peregrin’ I felt the texture was so vivid that I could see the black wrinkle of the black leather coat of the protagonist Eva Green. Under the bright sunlight, the leaves and grass in the shaded areas were clearly visible, and the hair on the main character ‘s face could be distinguished one by one. Kim Seok-ki, vice president of the Video Display division at Samsung Electronics, stated at the opening that Samsung is “currently working with many overseas movie theatres [but for] the domestic market will focus on Lotte Cinema for the time being.” Responding to the criticism that the screen was small, the point was made that half of the world’s screen are this size or smaller, but that the Cinema LED cinema can be scaled to be larger. The Cinema LED has not only passed the DCI compliance testing, but also seems assured of a steady stream of content, both from Korean film makers and Hollywood studios. 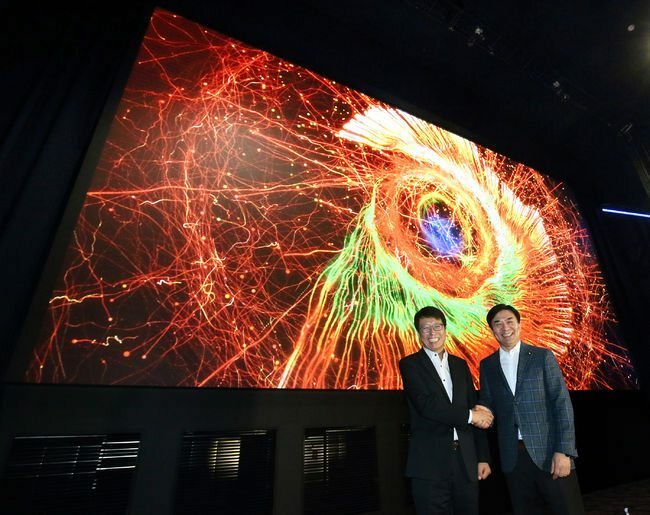 “We have been collaborating with Hollywood major filmmakers such as Fox and Universal Studios to build the best movie viewing environment, and we are strengthening the collaboration to expand HDR content,” a Samsung official was quoted as saying. 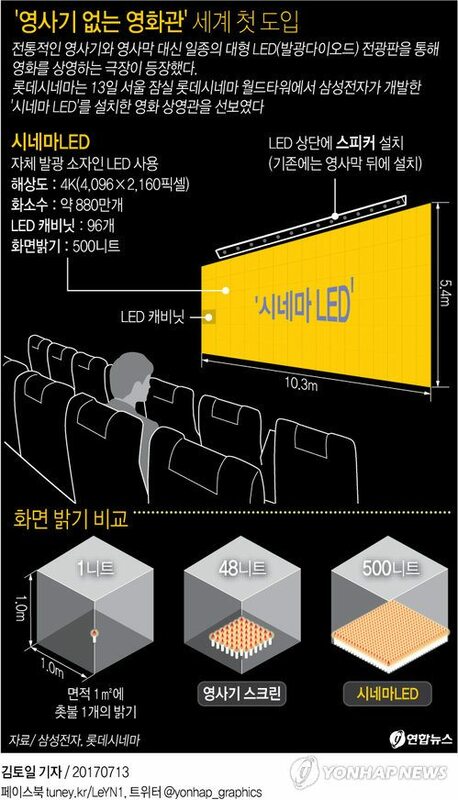 Lotte plans to take advantage of the 10x brightness that the Cinema LED screen offers. “We will introduce special features such as’ Kids’ Auditoriums’ and ‘Dining Auditoriums’ by utilizing the advantage of being able to see in bright surroundings,” Lotte Cinema, CEO Chun confirmed to Yonhap News. There also plans to show sporting matches, live broadcasts and music concerts. The following day (14 July) marked the start of regular commercial screenings of “Spider-Man: Homecoming” and Disney/Pixar animation “Cars 3”. Tickets will be priced KWN 12,000 (USD $10.64) on weekdays and KWN 13,000 (USD $11.52) on weekends. This is KWN 2,000 (USD $1.77) higher than ordinary tickets, or a 20% premium, but Lotte’s CEO felt that consumers would accept this price hike given the improved image quality. EToday became the first publication to dispatch a reporter to buy a ticket and experience the Super S Cinema LED as a regular patron. 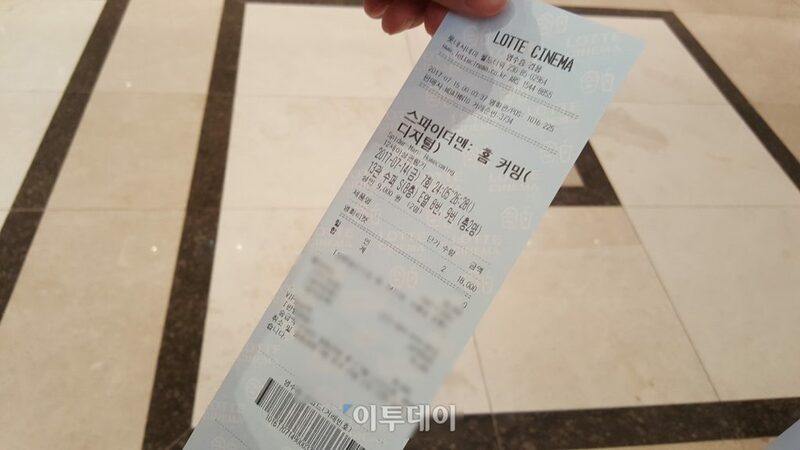 Jung Yoo Hyun writes that he had already seen “Spider-Man: homecoming” once in regularly projected digital 3D but was glad that he could see it again on the Cinema LED screen. The 20% ticket price increase will not come into effect until the end of August, yet despite this there were plenty of free seats in for the late screening. As the film started, the sound from Harman’s JBL speakers is described as “quite vivid” and that the sound is well tuned enough so that it can be enjoyed regardless of which seat in the cinema one sits in. Yet compared to “La La Land”, which the reporter saw in the same cinema, the sound was described as “satisfactory”, though with the caveat that “Spider-Man” is not a musical. There are rumours that Samsung will next open its second Cinema LED screen at an un-specified location in Los Angeles before the end of the summer. No doubt many more will follow if Samsung is to achieve its target of having deployed some 20,000 installations within the next three years. Tags: Samsung, Lotte Cinemas, Cinema LED, "Spider-Man: Homecoming"